Crooked teeth can make you hesitate before smiling, talking, or laughing, in addition to compromising your oral health. Crooked teeth are more difficult to keep clean, which is why orthodontic care is considered an effective preventive dental health treatment. Fortunately, you don’t have to live with a mouth filled with wires and brackets if you want to get your teeth straightened. Advanced Dentistry of Scarsdale is proud to offer Invisalign®, the original clear orthodontic care system for teens and adults. Here are some of the powerful advantages of Invisalign® in Westchester. 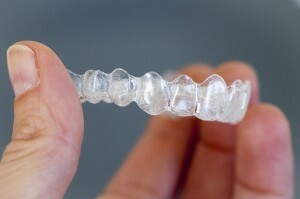 One of the biggest advantages of Invisalign® retainers is that they are nearly invisible. Created from acrylic that is just as durable and clear as it is safe, Invisalign® retainers make orthodontic treatment less stressful for everyone. Whether you are a busy professional concerned about how you look at work or a teenager concerned about maintaining a dating life, Invisalign® can help you to straighten your teeth without all of the stigma associated with traditional braces. Unlike traditional braces, which rely on a complex, uncomfortable network of sharp wires and brackets, Invisalign® retainers are smooth, contoured, and completely customized for your smile. In addition to preventing oral lacerations and scaring, Invisalign® retainers don’t have food restrictions like traditional braces do. Your Invisalign® retainers will be completely removable, and you only need to wear the retainers 22 out of 24 hours a day. In addition to removing your orthodontic appliances to eat and drink, you can also take them out to give that important speech or go out to dinner with a friend. Because Invisalign® retainers are removable, patients have the opportunity to take better care of their teeth and gums during orthodontic treatment, preventing gingivitis and periodontal disease. Patients who have Invisalign® typically report whiter, healthier teeth at the end of their orthodontic treatment when compared with friends or family members who have braces. Stop living with a smile that is holding you back. Schedule your consultation for Invisalign® in Westchester today. At Advanced Dentistry of Scarsdale, our team consists of industry experts and specialists, creating a comfortable, reliable experience for patients. Make your appointment today!